showiedoit | This is my place to tell you what I think. Deployment is almost over. You know you’re close when they hand out the customs forms to claim everything you bought. It’s almost hard to keep focus on the job, but you have to in order to get home. It has been a long half year. We’ve done a lot. We’ve been to a lot of places. We’re coming home with a lot of new experiences and memories. I can’t wait to get home. Pretty soon, I’ll be back in Hawaii where I plan to sit on a beach for a while. Our last stop was in Saipan (a tiny island north of Guam in the Marianas Islands) and it was great to go to a beach and just play some volleyball. It is totally true that sometimes, you miss the simple things. I can’t wait to get home and enjoy the simple things like they’re all brand new. Believe me, after six months of travelling, things will be all brand new again. Happy New Year! I hope everyone had more fun than I did considering that deployment isn’t quite over yet. It’s just a matter of weeks until I can return to the real world. I certainly have bright hopes for this new year…. No resolutions, but huge changes are on the way. This will be the beginning of the end of my time in the navy and it won’t be long until I’ll end my seagoing days. Life back in school and working are on the way. On the downside, my time in Hawaii will come to an end too. If you want to see it while I’m still there, get on it! I’m more than willing to host. Don’t go too crazy with resolutions. I’d hate to see you breaking yourself on a treadmill. Happy New Year to all of you! Again, we find ourselves in Guam. This wasn’t supposed to be the next stop, but a huge storm kept away from a better port. This port is really familiar to us and we’re learning to enjoy it. Guam is becoming the new “home” port. Just when we find ourselves getting out of here, we find the need to rush back. As usual, the schedule has changed so we what we’re doing next is even more up in the air. It’s amazing that we get anything accomplished at all. This is going to be a long deployment. Hopefully it won’t be pointless too. Our first port call was Yokosuka, Japan. That was pretty awesome. I lived there many years again and it was great to see what had changed and what had stayed the same since the 20+ years again that I lived there. My mom lives there now and it was also an opportunity for us to reconnect and even celebrate our birthdays, which we weren’t together for. Harvey lit the candles and gave us a very Marilyn Monroe-esque rendition of Happy Birthday that I really wish I had recorded. Very silly. Very necessary. After about a month away from home, I’m making my second port call in Guam. It’s just as hot and humid as it was last year. As familiar as this port is to me, it is far from my favorite. It’s hard to get around and the heat takes away the motivation to walk anywhere. The time is passing slowly this deployment, but it helps knowing that this will be my last one. I can rest knowing that I have a whole new life ahead post-navy. Until then, I’ll have to make my way through this one. I’ll try to keep this a bit more up-to-date than I have in the past. I get the feeling that I may not be able to communicate much once we leave here. Who knows where we’re headed next? Only time will tell. Today is a beautiful day. 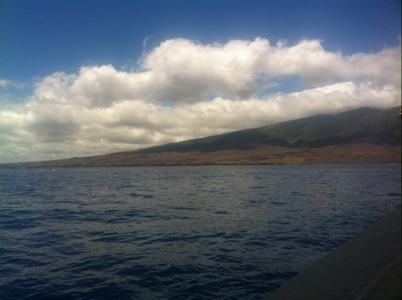 Since it was so nice out, we decided to take a little swim and take in this great view of the Hawaiian Islands. The water is so awesome and you almost wish you could do this everyday. Swimming in the middle of the ocean is even errrr than swimming at the beach. This is About as good as the 4th of July can be when you’re underway. Being away from home is never easy. You miss people. You miss places. You miss your stuff. You miss HOME. The more time that I spend away from home, it makes me realize what I really want out of life. I don’t need to be rich or famous, just people who like me in places that I like to be. All my life, I’ve been blessed with the gift of making connections with people and making friends. I have met so many great people along the way and I wish I could take them all with me on the adventures I have from day to day. Each place has brought me more people to miss when I leave. I often think that I’m tough enough to go it alone, but as I get older, I realize that those connections and friends are what make me me. I think of my friends all the time and I’m so thankful that I know each and every one of you.